Encouraged by the results of this small study, Fishman decided to invest his own money to conduct a much larger study. He enlisted three collaborators — Yi-Hsueh Lu of The Rockefeller University, Bernard Rosner of Brigham and Women’s Hospital, and Dr. Gregory Chang of New York University — and solicited volunteers worldwide via the Internet for a follow-up of the initial pilot study. SED rate (the rate at which red blood cells sediment, which if elevated may indicate a number of conditions in addition to increased inflammation, e.g., anemia, autoimmune disorders, infections, some kidney diseases and some cancers. All volunteers were sent a 10-minute DVD of the 12 poses that had been found to improve BMD in the pilot study along with verbal descriptions of each pose. Of the 741 people who joined Fishman’s experiment between 2005 and 2015, 227 (202 of whom were women) actually followed through and did the 12 yoga poses daily or at least every other day. The average age of these 227 participants when joining the study was 68; 83% of them were either osteopenic or had osteoporosis. Before entering the study, participants had been consistently losing bone: their pre-study DEXA scans showed an average monthly loss in BMD of -0.036 g/cm2 in the spine, -0.017 g/cm2 in the hips, and -0.03g/cm2 in the femur, prior to starting yoga practice. After 2 years, the participants who stuck with the program and did the series of 12 yoga poses at least every other day were consistently building bone: + 0.048 g/cm2 in the spine, + 0.088 in the hip, + 0.003 in the femur. Before the study, the participants had experienced 109 fractures, reported by them or found on X-rays, but none suffered a further fracture due to yoga practice. 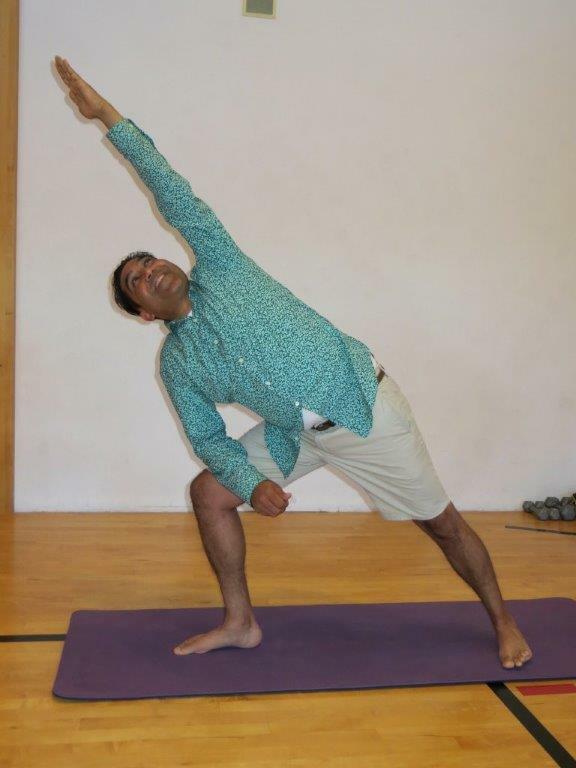 To date, with more than 90,000 hours of yoga practiced largely by people with osteopenia or osteoporosis, no reported or X-ray detected fractures or serious injuries of any kind related to the practice of yoga have occurred in any of the study participants. Having reviewed this inspiring research, I (Lara) will be practicing these 12 yoga poses daily, using Yoga for Osteoporosis, Dr. Fishman’s book, which he co-authored with Ellen Saltonstall, (Fishman & Saltonstall, Yoga for Osteoporosis, W.W. Norton & Company: New York, 2010) and the DVD from Manhattan Physical Medicine. I’ve provided pictures of the poses here in this article to give you an idea of the routine, along with a few other Pilates-based exercises that are safe and very helpful. However, to fully understand and get the most bone-building benefit from your yoga practice, I urge you to order the DVD and/or Yoga for Osteoporosis for the very detailed explanations they provide. In addition, beginning your practice with the help of a skilled yoga instructor who can help ensure your alignment is correct is highly recommended. 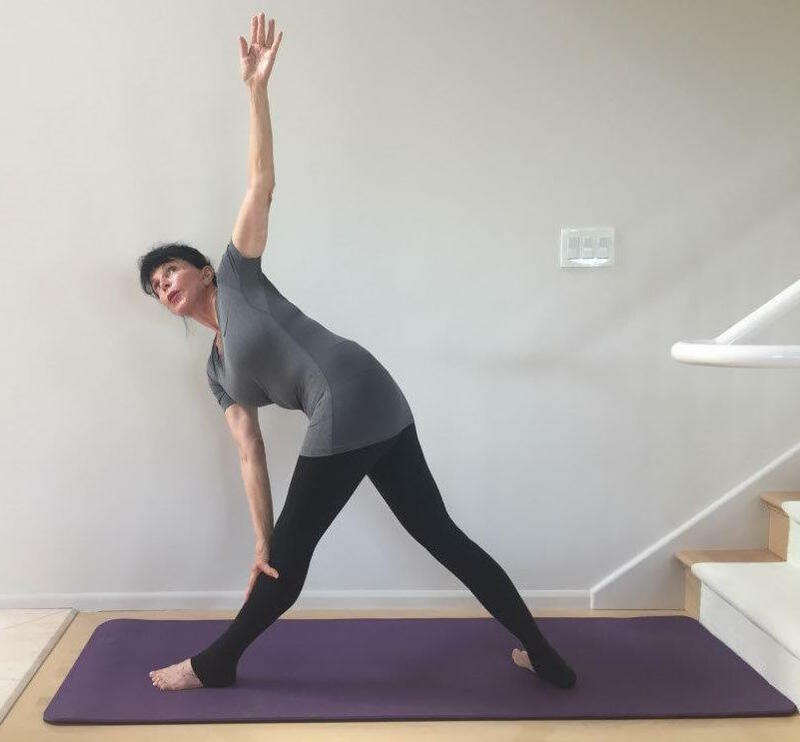 Fishman believes yoga is “the answer for older people who want to stay strong, flexible and pain-free.” In Yoga for Osteoporosis, he and Saltonstall explain why. The application of force is key for healthy bones. Force applied to bones stimulates them to grow stronger at the point where they are stressed – this is a well-known principle of physical medicine called Wollf’s law. Developed by the German anatomist and surgeon Julius Wolff (1836–1902), Wolff’s law states that bone in a healthy person or animal will adapt to the loads under which it is placed by remodeling itself over time to become stronger to resist that sort of loading. And the process begins almost immediately: within bone, levels of different enzymes and biochemical markers of bone synthesis increase within 10 seconds of subjecting bone to stress. Yoga is also beneficial as it can improve balance, muscle strength, range of motion and general coordination. The whole package contributes to your ability to stay upright and not fall. Obviously, if you don’t fall, you greatly reduce your risk of a serious fracture. And last, but definitely not least, aside from its directly physical effects, yoga soothes the nervous system, which reduces stress and anxiety, often leaving its practitioners with a sense of peace and well-being. Your “approach” and “how” you practice yoga is key to its beneficial effects on your bones. 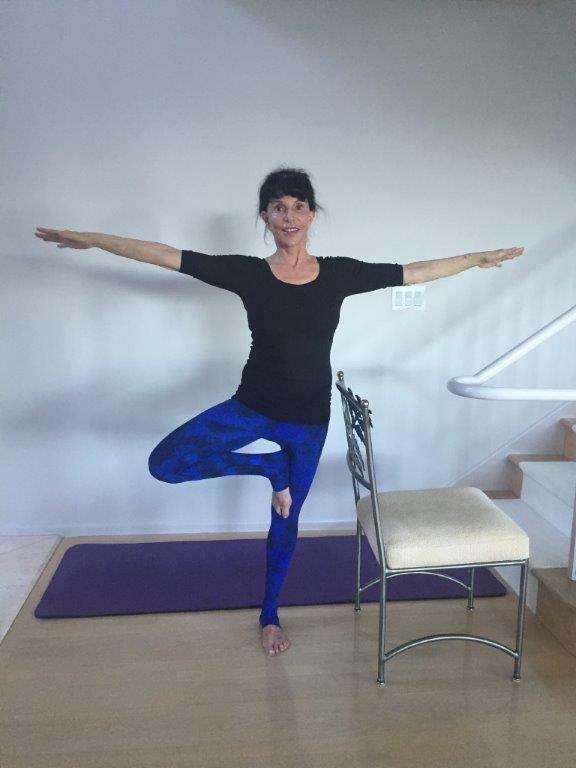 Taffy Frost recommends practicing yoga using the following guidelines and principles, which she learned from Dona Holleman. These principles will help you develop awareness, which in turn will lead to “working with the intelligence” in your body. Your body is continually giving you feedback, but until you develop an awareness, you won’t be able to hear it. We want to get rid of as much tension in the body as possible before we practice. We do this so we can reach the deeper layers of the muscles (closer to the bones themselves). Starting in a comfortable position, follow and feel a full cycle of breath. And then another. The mind will wander. When you notice it has wandered, simply bring your focus back to the breath. No judgment, just a gentle re-focus back to the breath. Scan the body with your “internal eye” and where there is tension – relax. This first step helps the body become stable and still as well as helping quiet and “empty” the mind. Think of your yoga time as time for you to renew and care for your body – let the cares of the day melt away (they will be there later, and you’ll be in better shape to deal with them). Working with a quiet mind will intensify your practice in a good way. We un-do first, then do. See and feel your intention for your practice. See and feel your objective. As the mind directs itself, the body begins to center itself for the practice, and this lends itself to a fuller, more focused and beneficial result. Whatever part of the body is in connection with the earth, allow this connection to press down or sink into the earth. Rest into the grounding, supportive power of this downward movement. Think of how the roots of a tree deepen and widen into the earth, providing grounding and stability. From stability, comes a lightness and freedom for the branches to expand and move into the sky. As you feel your own downwardness, start to connect with how this base of support also facilitates a sense of lightness and length in your body. 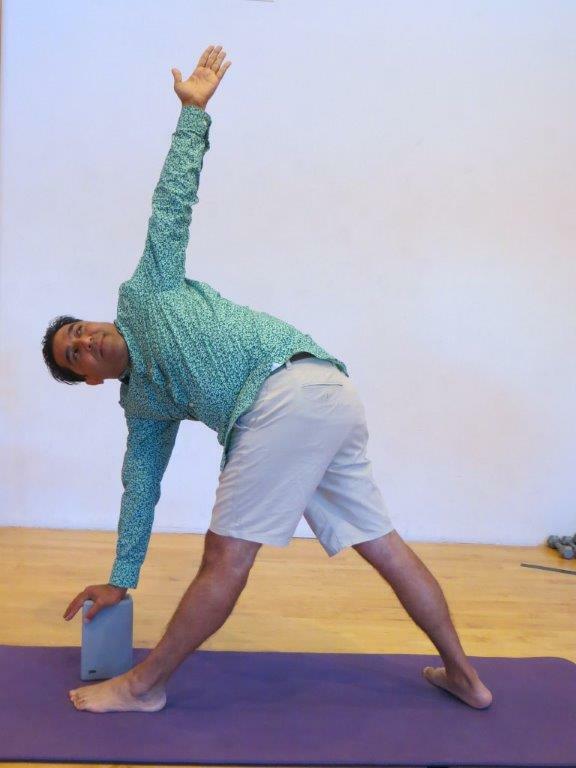 In each yoga pose (asana), always be aware of the two opposing directions that are connected to each other. In every asana, the furthest part of the body from the ground remains deeply supported by the other part of the body that is rooting into the ground. Because of this connection, all parts of the body remain in balance and work together in harmony. Be aware of your inhale. Be aware of your exhale. While inhaling, the body elongates and widens; while exhaling, it steadies itself in rooting and connecting. The nature of the breath will change from sweet and soft to deep and long, and anywhere in between. The duration of inhale and exhale will also change, sometimes one being longer or shorter than the other. Sometimes the breath will be in the background, other times it is the source of action, but the breath flows through and energizes all. The above principles all work together, and you want to apply all of them continuously throughout your yoga practice. How do you do this? You deepen your understanding of each principle by choosing one or two of them and work with them over time. Become curious! As you practice, they will penetrate your being and become second nature. We spend far too much time sitting, both at work and at home. Our largely sedentary life encourages a forward curvature in the spine – longer and rounded in back, shortened and compressed in front (think of it as training for the so-called Dowager’s hump, the stoop forward posture of osteoporosis). Eventually, if we don’t actively counteract it, this posture gets locked in – greatly increasing our risk for vertebral fracture. And it’s not pretty! You want to move through life erect and graceful, not hunched over. — plus a few more safe, helpful poses from Taffy and Lara. Taffy suggests always beginning with Tadasana to center yourself and establish core awareness. Tadasana is your primary posture, whether practicing yoga or going through your daily activities with ease and grace. When moving from pose to pose, transition through Tadasana. Root whatever part of the body is on the floor into the earth. If your feet, feel your weight distribute evenly across your feet. Press all your toes into the floor, the full balls of your feet and your heels, not just the inner or outer edges. If supine, let the floor beneath you ground your entire body: relax the back of your head, let your shoulders open wide and rest into the floor along with your rib cage. You should feel a small egg-sized pocket of air between your waist and the floor (this is the natural curvature of a healthy spine), but your hips, legs and feet should feel deeply relaxed and grounded. Whether standing or supine, connect with your breath. Let the flow of your breathing fill you. You will naturally lift, elongating your spine, and the crown of your head will lift away from your shoulders, lengthening your neck. Think – long spine. Do not arch your back, pushing out your rib cage. Instead, energize your pelvic floor (think mild Kegel exercises), pull your navel into your spine to awaken your core strength, and you will feel yourself lift and elongate. Let your shoulders open and your shoulder blades drop flat down your back. Lift from your tailbone up through the crown of your head. Benefits: strengthens the legs and hips, improves balance, posture and focus. Osteoporosis modification: Place a sturdy chair near the wall, and use the back of chair and, if needed, the wall to help you balance. Push your left foot into the inside of your right upper thigh. Stretch the opposite arm up (your right arm, in this case). Then intensely stretch out from the core of your pelvis both up to the ceiling and down to the floor. Hold for several full breaths. Switch legs. Osteopenia modification: stand next to the chair, in case you need it for support. Place your left foot on your upper inner right thigh and extend your arms out to the side. Benefits: stresses the greater trochanters, anterior lumbar and posterior thoracic vertebrae, and pubic bones, builds stamina, focus and balance. Osteoporosis modification: stand in front of wall next to chair in warrior, right toes under chair, left foot rotated out, align right heel with arch of left foot, arms outstretched, rest right hand on the chair without letting hips and upper torso come forward. Curve tailbone down, lift abs up, lengthen out through the spine. Extend torso out, bending at hips not waist. Stretch occurs in back of right leg and on left side of pelvis. Repeat on opposite side. Osteopenia modification: Same pose placing your hand on a yoga block behind your right foot instead of the chair. Repeat on opposite side. Benefits: stimulates the femur and pelvic bones, improves hip mobility, balance, leg strength. Sit across a sturdy chair or, if standing, use the wall, a handrail or a chair that won’t fall over for support. Root down into all four corners of your feet. Drop your tail bone down while you elongate the crown of the head towards the sky. Relax your shoulders and let them drop away from your ears. Draw your shoulder blades toward each other. Extend your arms, fingers spread, muscles engaged, and gaze over the middle finger of the front arm. Keep your hip bones level and even. Your front knee should be directly over your ankle. If this is not yet possible, keep your front knee slightly behind your ankle as you gain mastery of the Warrior pose. Osteopenia modification: Same pose, standing, no chair. Benefits: produces stimulating torque to the entire central and peripheral skeleton. Osteoporosis modification: Sit on a chair, legs spread apart, and lean to the right, moving from the hip, not the waist. Rest your right forearm on your right thigh. Extend your left leg straight, firm your abdominal muscles, place your left hand on your left hip and roll your left shoulder back until your entire upper body faces outward. Turn your torso enough to the left to grasp the back of the chair with your left hand and look up, being careful not to hyperextend your neck. Think L-O-N-G spine. Repeat on opposite side. Begin in Warrior II with your arms outstretched, then extend to the right side, resting your right elbow on your right knee and reaching your left arm up and back. Look up at your left arm. Be sure to keep your torso facing forward and your spine long. Repeat on opposite side. 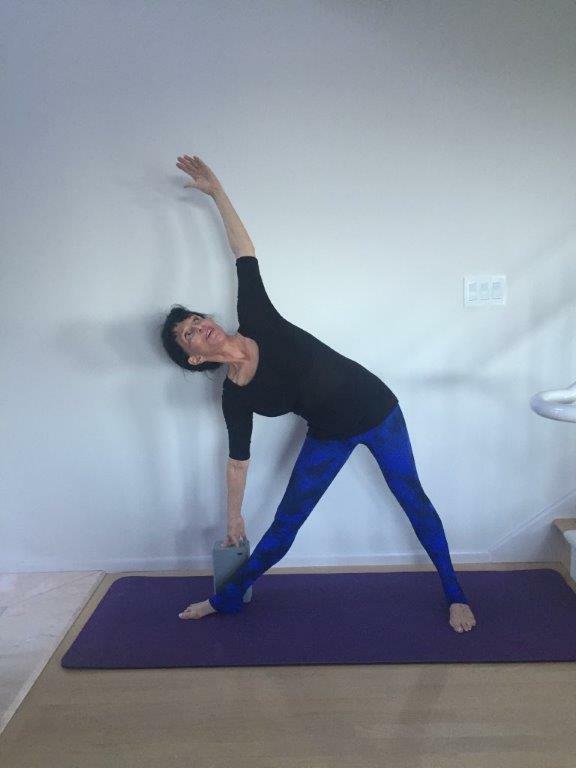 Osteoporosis modification: Place a yoga block at the top of your mat. Stand about a foot back from the block at the top of your mat in Tadasana. Step your right foot back 2-3 feet, slightly angling it toward the outer edge of your mat. Square your hips, raise your arms up overhead, inhale and hinge forward from the hips, keeping your spine L-O-N-G. Once your fingers have reached the block, leave your right hand on the block, raise your left arm up toward the ceiling and open your torso to the right. Inhale, then exhale and roll your right shoulder back as you extend your left hand straight up to the ceiling. Turn your head to gaze up at your left thumb. Hold the pose for 30 seconds to 1 minute. Gently release the twist, press firmly through your left heel, lift your torso and lower your arms. Repeat on the opposite side. Osteopenia modification: the same pose as above, but you can rest your bottom hand on the shin of your front leg or, if flexibility allows, near the inside of the front foot instead of on the block. Benefits: strengthens the muscles of the back (including the erector spinae, which support the vertebrae), buttocks, and backs of the arms and legs; stretches the shoulders, chest, belly, and thighs; improves posture; stimulates abdominal organs; helps relieve stress. Lay on your belly, legs side by side. Activate your pelvic floor muscles and lengthen your tailbone toward your heels. Rotate your thighs inwardly by rolling your outer thighs toward the floor. This helps broaden and lengthen your lower back and sacrum (the downward-facing triangular bone at the back of your pelvis) to protect it. Extend your arms alongside your torso, palms down and reaching actively towards your feet – think of trying to touch the wall behind you. Use your exhale of your breath to activate your core and elongate your spinal column. Lift your chest off the floor 2-3 inches, which will activate your erector spinae, the muscles that support your spine. Bring awareness to your lower belly, the area just below the navel. Lightly activate your pubic floor (the muscles that contract when you do a Kegel exercise or stop the flow of urine) and transversus abdominus (a muscle that wraps all the way around your hips like a supportive corset), drawing your belly up away from the floor and into your lower back. This very subtle belly lift supports your lumbar spine, protecting your lower back and awakening the erector spinae in your lower and upper back. Hold the pose for several full breaths, then as you exhale, slowly lower your torso and release your belly. You can let your forehead rest on a rolled towel on the floor. Lie quietly, broadening your back with each inhale, releasing any tension with each exhale. Then, lie on your belly with your arms along the sides of your torso, palms up, forehead resting on a rolled towel or the floor. You might want to pad the floor below your pelvis and ribs with a folded blanket. Inwardly rotate your thighs by turning your big toes in towards one another, gently firm your buttocks, pressing your tailbone toward your pubis. Inhale, activate your core. Exhale and lift your legs away from the floor, firming your buttocks. Reach strongly through your heels, lengthening back of your legs. Then think of elongating your knees and shins away from your hips, lengthening the front of your legs. Be careful to maintain a long, neutral spine. Don’t jut your chin forward and crunch the back of your neck. Keep extending through the crown of your head, elongating your neck. Combine the two movements. On the inhale, lift your feet, legs, hands, arms, chest and head off the mat. Roll your shoulders on to your back and firmly engage your back muscles. Be careful not to jut your chin forward and overextend your neck. Again, you want a L-O-N-G spine. Benefits: The Bridge pose will strengthen your core, gluteus maximus (buttocks) and hamstrings, and also the deep inner muscles that act as hip stabilizers (your gluteus medius and minimus, piriformis, quadratus, vastus lateralis, the adductors, and more). 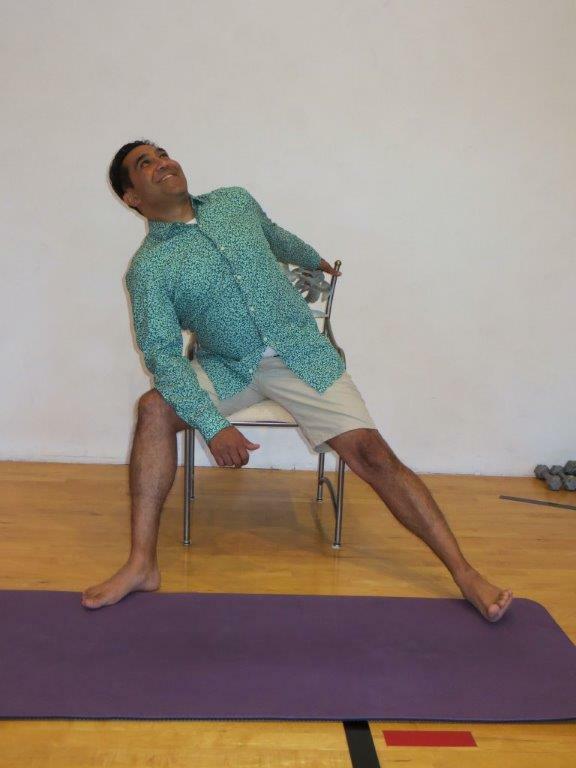 This pose also helps combat khyphosis, the rounding of the thoracic spine (upper back and rib cage) that so often develops in osteopenia and osteoporosis. The thoracic spine tends to compress and drop forward as the vertebrae weaken, but khyphosis develops in part because the muscles on the front of the body shorten and become tight. These muscles include the pectorals, rectus abdominus, internal and external obliques and the intercostals (the muscles between the ribs). The intercostals help with exhalation, so if they have become short as a result of not breathing deeply or prolonged slumping, this also contributes to developing khyphosis. The gentle, supported extension provided by the modified Bridge pose will begin to open the front ribs and thoracic spine. In all supine poses, if you have developed kyphosis (rounding of the upper back, a.k.a. dowager’s hump), use a pillow to support your head and enable you to maintain your spine in neutral alignment. Lie supine on your mat, feet hip-width apart and firmly rooted. Reach your arms long and out to your sides, palms down. You can also help stretch the pectoral muscles and open your chest by rotating your shoulders externally. Turn your palms forward and your shoulders will naturally roll open, back and down, pressing your shoulder blades into the back ribs. 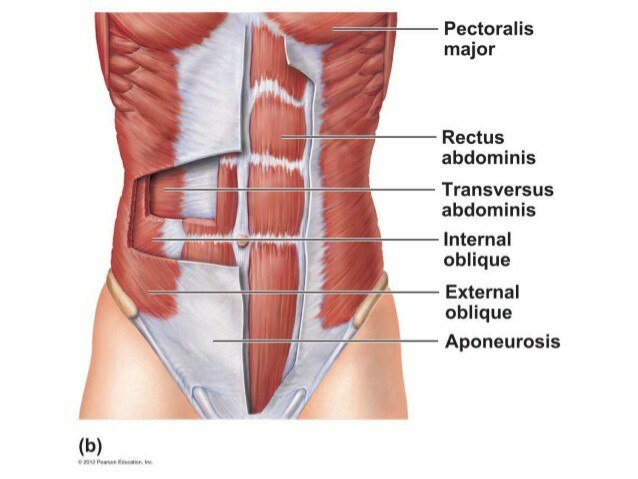 Move from neutral into flat spine (see Yoga exercises that safely strengthen the abdominal muscles: Neutral to Flat Spine contractions below), engaging your pelvic floor, rectus abdominus and transverse abdominus muscles (see images of muscles above). Engage your gluteus and hamstring muscles. Lift your hips 1-inch off the floor and hold. As your pelvis and back rib cage lift off the floor, and your arms press down into the floor, let your shoulders relax and open. 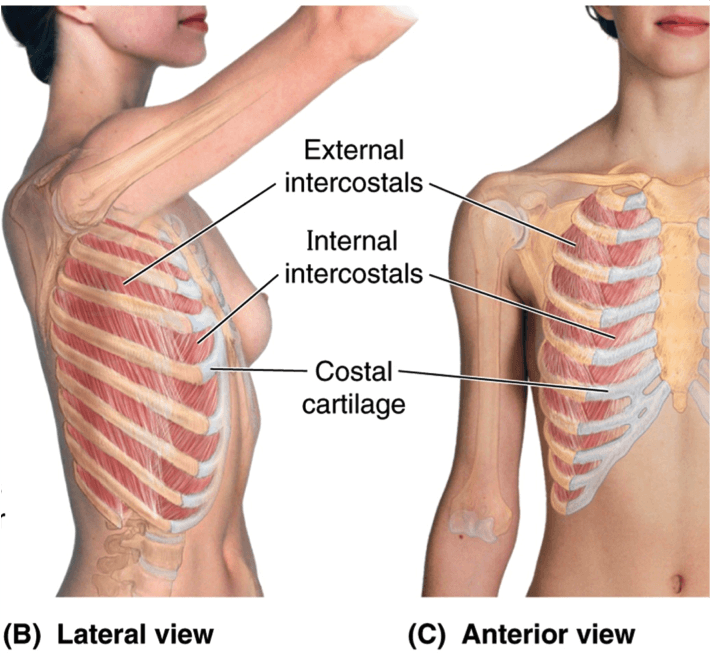 You’ll be gently stretching the upper portion of your pectoralis major and the front of your deltoid (the muscle that forms the cap covering the shoulder joint (see image above). This will help you reverse the rounding in your shoulders and elongate your thoracic spine. Bring awareness to your neck. You should be looking directly up to the ceiling, not back, which will hyperextend your neck, and not forward, causing your chin to move toward your chest as this will flatten the natural healthy curve in your neck. If your tendency is to hyperextend, check that you are looking straight up, not back. To check that you are not tucking your chin, touch the underside of your neck. If your neck is flat against the floor, gently tilt your head slightly back, just enough to create a little space between the vertebrae in your neck and the floor. For support, you can place a folded blanket (2×3 feet), or two folded blankets, under your arms and shoulders, with your neck curving over the edge of the blanket(s) and your head resting on the floor or if you are lying on a mat, the mat. This will reduce the flattening and remove any strain on your neck. Over time, the extensors on the back of your neck, will stretch and lengthen. Breathe and relax into the stretch for a couple of minutes. As you become more flexible, you can remove the supporting blankets and will become able to gradually lift your hips higher, more fully extending your thoracic spine. Lie on mat, wrap belt or strap around arch of one foot and raise that leg up for stretch while extending the other leg long on the mat. Only raise your leg as high as you can keep your tailbone fully on the floor. To do so, inhale and then on your exhale, activate the muscles of your pelvic floor, your rectus abdominus and your transversus abdominus and drive your belly button back towards your spine. Keep breathing, but maintain a light contraction of these pelvic muscles. Keep your back flat, tailbone long, shoulders wide and open. If your neck feels strained, place a blanket, thin pillow or towel under your head to support your neck. Lie on mat, wrap belt or strap around arch of one foot and raise that leg up for a stretch while extending the other leg long on the mat. Externally rotate the leg you are stretching and release it to the side. Extend your opposing arm. Feel yourself widening and opening. As in Supta Padangusthasana I, do not let your tailbone curl up off the floor and keep both hips fully on the floor. Activate your pelvic muscles to stabilize you and give you the support you need to do so. Place a pillow alongside the leg you are extending to the side, so you can rest your thigh on it for more support (as shown in the Supine version of the Bent-leg Twist below). This will help you fully relax and open the hips. As in Supta Padangusthasana I, do not let your tailbone curl up off the floor and keep both hips fully on the floor. Activate your pelvic muscles to stabilize you and give you the support you need to do so. Benefits: stretches the back muscles, encourages movement and mobility in the spine and vertebrae. Since you are in the supine position where your spine is least loaded, the twisting pose, can be safely done. However, it must be performed in a slow, controlled manner and not taken to end-range. Lie on your back with your arms extended out 90 degrees at your sides, keeping palms up. Breathe! Flex your feet bringing your ankles and legs together. Bend your knees keeping your ankles together. then twist your hips no more than 10 or 15 degrees to the right, using pressure on the floor with the back of your right arm and hand to keep your torso in line. If your left shoulder comes off the floor, and pressure on the floor with your right arm doesn’t help, you’ve gone too far. Rest your knees upon pillows or a bolster on either side at first rather than let the weight of the knee pull the twist to end-range of motion. Over time, as strength and flexibility develop, gradually increase the twist of your hips, keeping the knees bent and relatively in line with each other. Benefits: Stresses lumbar and thoracic vertebrae, shoulder joint, and the femurs. Osteoporosis modification: Stand facing the seat of a chair, feet parallel and hip width apart. 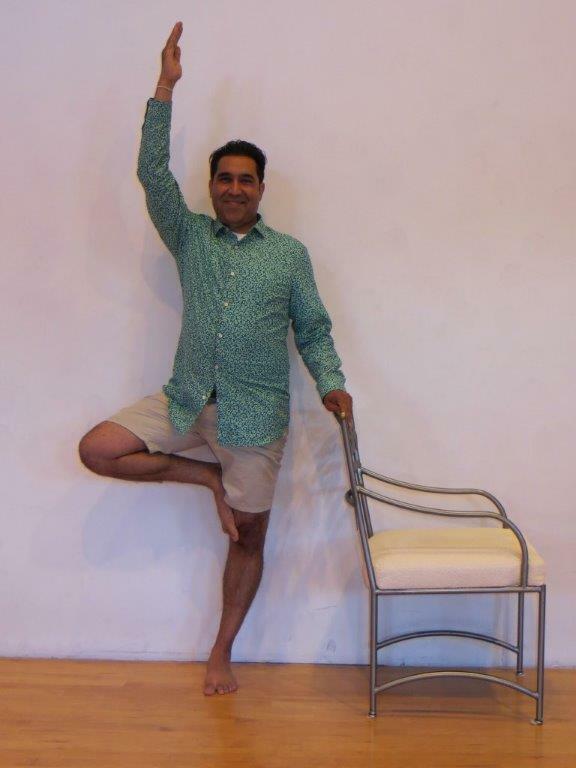 Place your right foot on the chair seat with knee and foot aligned in front of your hip. Firm your leg and spinal muscles. Move the left top thigh back, lengthen the tailbone down, lift your lower abdomen, place your right hand on your waist and left hand on your thigh. Inhale and root down through your left leg. Exhale and turn your spine above your waist to the right. Pull with your left hand on your right knee to help yourself twist. Actively wrap your left lower ribs around toward the right. Resist the tendency to move forward and open your right should back to the right. Keep your shoulders, head and hips level. Lie flat on your back, knees bent, feet flat on the mat. Inhale and let your ribs expand fully. This will slightly increase the egg-sized pocket of air between your waist and the mat. Then exhale and contract the muscles of your pelvic floor and your abdominal muscles (rectus abdominus, transverse abdominus and obliques) to shorten the distance between your ribs and hip bones, and flatten your back to the floor. Check that you are doing this correctly by placing your thumbs on your lower ribs and your index fingers on your hip bones. When you engage your abdominal muscles, your index fingers will move close to your thumbs as your back flattens into the mat. Check that you are not using your gluteus muscles (buttocks) to move your hips towards your ribs. Touch your buttocks, they should be soft, not contracted. If they are tight, relax them and start over using only the muscles that lift your pelvic floor and flatten your abdomen. The need for this practice never goes away, no matter how advanced your exercise routine becomes. As your strength develops, you can slowly lift one knee at a time from the floor while being sure not to lose your flat back and tummy. You can place your hands on your abdomen to feel if you are maintaining the contraction. If your hip bones tilt forward, you’ve lost it. Planks strengthen all your muscles. If you have osteoporosis, start out with the Wall Plank. As you build strength, you can try the Bent Arm Plank, remembering that you can always lower your knees to the mat. If you have osteopenia, you may find you can quickly move from the Wall Plank through the Bent Arm Plank to the Full Plank. Again, remember that you can always lower your knees in the Bent Arm or Full Plank. Begin in Tadasana, 2-3 feet away from the wall. Inhale and maintaining your long spine, raise your arms to shoulder level and tilt your posture so that your hands brace against the wall. Root all your toes deeply into the floor. Engage your hamstrings and gluteus muscles. Activate your inner thigh muscles, so that you lift into one long fully engaged column. Lengthen through the back of your legs. Check that your pelvic floor and abdominal muscles are engaged. Exhale and drive your belly button towards your back to support your spine. Breathe in and elongate your neck, reaching the crown of your head away from your shoulders. If your shoulders start to creep up toward your ears, gently lower them, letting your shoulder blades drop and flatten into your back. Open wide through your collarbones. Lift your chin so that you are looking straight ahead. Breathe and keep scanning from your toes to the crown of your head. With every breath, grow taller. Begin in Tadasana. Hinging at the hips, bend forward keeping a flat spine, and bending your knees until your hands can firmly touch the floor. Bend down fully bringing your knees to the floor. If balance is an issue, use a sturdy chair or railing for support. You can use your transition from standing to the floor to practice another helpful exercise on the way. The following picture shows the yoga pose, Downward Facing Dog, modified for osteoporosis. Hinge forward at the hips, keeping your back flat and long, and knees gently bent. Rest your extended arms on the chair seat and then use the chair to support you as you continue to bend your knees and lower yourself to the floor. Once on the floor, move onto your hands and knees, keeping your spine level and elongating from your tailbone out through the crown of your head. Maintaining your flat, long spine, lower your elbows to the floor. When fully braced into your elbows, lift first one knee and then the other knee away from the floor. Lengthen your legs and root your toes deeply into the floor. Engage your core, lifting your midsection away from the floor. Engage your hamstrings and gluteus muscles, which will help you lift. Pull your belly button up and in towards your spine. Keep breathing! Activate your quadriceps (the muscles on the front of your thighs), pulling your knees up to support your legs. Activate your inner thigh muscles, as if you were pulling your legs closer together (don’t, but activate these adductor muscles to fully engage your legs). Become one long, fully engaged, powerful column. Lengthen through the back of your legs. Breathe. Check that your pelvic floor and abdominal muscles are engaged and supporting your spine. Your spine should remain in neutral alignment, neither drooping down nor hunching up. Both sides of your hips should be level with one another. Breathe in fully and elongate your neck, reaching the crown of your head away from your shoulders. If your shoulders start to creep up toward your ears, gently press them down, letting your shoulder blades drop and flatten into your back. Open wide through your collarbones. Look straight down at the floor; don’t look ahead as this will over-extend your neck. Lengthen the back of your neck and grow taller. Keep breathing! And keep scanning your engagement and alignment from your toes to the crown of your head. With every breath, grow longer and stronger. Begin in Tadasana. Move onto your hands and knees as outlined above. When fully braced into your palms and all ten fingers with your hands directly below your shoulders, lift first one knee and then the other knee away from the floor. Root your hands and toes deeply into the floor, evenly distributing your weight between each of your shoulders and each of your feet. Lengthen your legs. Engage your core, lifting your midsection away from the floor. Pull your belly button up and in towards your spine. Keep breathing! Activate your quadriceps (the muscles on the front of your thighs), pulling your knees up to support your legs. Activate your inner thigh muscles, as if you were pulling your legs closer together (don’t, but activate these adductor muscles to fully engage your legs). Become one long fully engaged powerful column. Lengthen through the back of your legs. Breathe. Check that your pelvic floor and abdominal muscles are engaged and supporting your spine. Your spine should remain in neutral, neither drooping down nor hunching up. Your pelvis should be level. Breathe in fully and elongate your neck, reaching the crown of your head away from your shoulders. If your shoulders start to creep up toward your ears, press them down, letting your shoulder blades drop and flatten into your back. Open wide through your collarbones. Look straight down at the floor; don’t look ahead as this will over-extend your neck. Lengthen the back of your neck and grow longer. Keep breathing! And keep scanning your engagement and alignment from your toes to the crown of your head. With every breath, grow longer and stronger. Remember, you can always lower your knees. The key point here is to keep your spine l-o-n-g. Always take a moment to end with Savasana. Its purpose is to let you fully and completely relax, and to let the energy released work deeper, helping your muscles and bones assimilate the improved postural alignment you have practiced. If your neck and shoulders are rounded forward (kyphosis), you may want to rest your head and neck on a folded blanket, and also place a folded blanket or pillow under your knees to further support your back. Make sure that the blanket supporting your head and neck does not prevent your shoulders from opening and relaxing flat on the floor. Once again, think L-E-N-G-T-H. Lengthen your legs out fully away from your hips. Let them relax and fall open. Elongate your spine from your tailbone out through the crown of your head. Let your shoulders relax into the mat and open fully, so your collarbones are wide. Inhale deeply, but try not to let your ribs pop up. Exhale fully and let your belly button sink deeply into your abdomen. 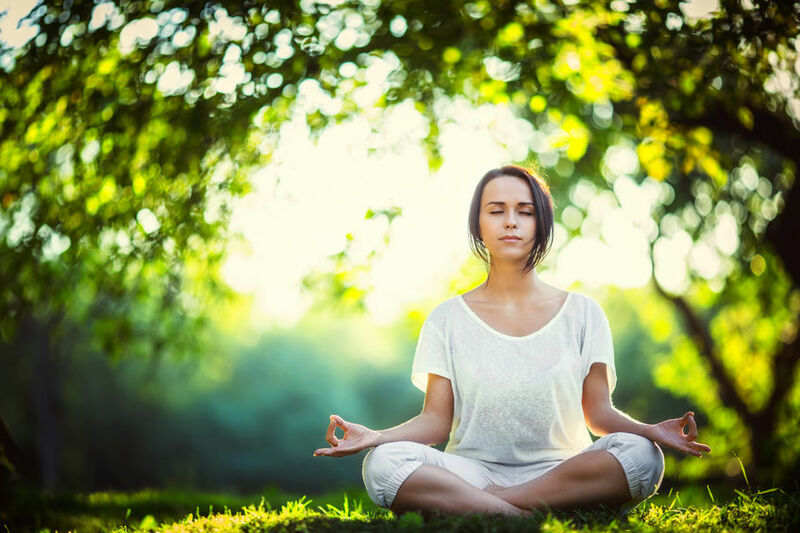 Keep breathing deeply and RELAX, enjoying your improved posture and strengthened muscles. Feel your bones renewing themselves! We hope you enjoyed this post as much as we enjoyed putting it together for you. Yoga is not only great for your physical fitness and balance, but amazing for your mental wellbeing! And you can do it in the comfort of your own home, at your own pace. Also, I wanted to quickly share a story that brought a smile to my face. Im sure many of you have heard about Anna Pesce, and 85 year old from Orangeburg, NY, who managed to beat the scoliosis in her back. After completing yoga therapy with certified yoga instructor Rachel Jesien. Prior to the therapy, Anna needed a wheelchair to get around and has a sever hunch in her back. Today, she can stand up straight! I just love success stories like Anna’s, and I hope yoga can help you in some way too! You can read more about Anna’s story here. Please send me the PDF so I can get to work!! Hi – looks like we need to request a pdf so please add me to the list for these wonderful yoga adaptations. Thank you! Hi. I’ve been wanting to start yoga since being diagnosed with osteopenia and came across your post. Could you please send me a pdf of the poses. I would love to try them. Thanks!! I am a huge fan of AlgaeCal. Thank you for this yoga info. Please send me the printable version to my email asap. Thanks in advance. I also have Osteoporosis. Would you please send me the printable version of Fishman’s 12 yoga poses for osteoporosis. Thank you so much!!! I would like a printable version of these yoga poses also. Thank you. I have just read through all of the exercises for osteoporosis. I have severe osteoporosis -4 in my spine. I have been taking algaecal since August 2018. I have been going to the pool doing exercises for 6 months. the chlorine is bothering me and would like to do home based exercises. Please send me the pdf’s on all exercises. Thank you so much. but I want to do more to build my bone mass. Please send me Fisherman’s 12 Yoga Poses. I have Osteoporosis and I just ordered AlgaeCalPlus and would like poses focussing on ways I can improve. Of course, Tina! Great to hear you’re choosing the natural approach to stronger bones! What a great article on yoga exercises aimed at strengthening the core body. I would love to receive the PDF for this article so that I can print it. Many thanks. Please send me the printable version of Yoga for osteoporosis. I’d love to start working on these promptly. Will do, Veta. Hope you find the poses beneficial! Could you please send me the printable version of the yoga poses for osteoporosis. I am recovering from a hip fracture and want to start some hip strengthening exercises too. Thank you. Sure thing, Gale! We also have a blog post on hip strengthening exercises here. Considering you’re recovering from a hip fracture, it may be a good idea to speak with your doctor before introducing any new movements into your routine! Such a great article and I have already forwarded it several times. Could you please send me a pdf ….thank you! Awesome, thanks so much for sharing Tara! You should receive an email from me shortly with the PDF. Hello, I greatly appreciate all the information you provide on your website. Will you please send me the printable versions of both Yoga and Tai Chi for osteoporosis? I need the osteoporosis yoga, please, sent to me. Thank you! Can I get a copy of the yoga poses sent to me please? For sure! You can expect an email from me shortly Michele. I want to join in and ask for a pdf of this post, so I can have it with me as I do these poses. I tried to print the article off myself, but for some reason the last few photos don’t show up. Thank you! This is a wonderful article! Thanks for taking the time to include photos. I too would love to have a printable version. I’m committed to doing yoga and this would be perfect. Thanks in advance! Thank you for an excellent article on osteoporosis exercises. Can you please send me a pdf of the 12 yoga exercises discussed in this article? Thank you so much for all this information. I’ve been taking the algaecal plus and the Boost since October . I recently started taking yoga and was wondering if it actually would be helpful. Did you say there was a video of the 12 yoga poses? 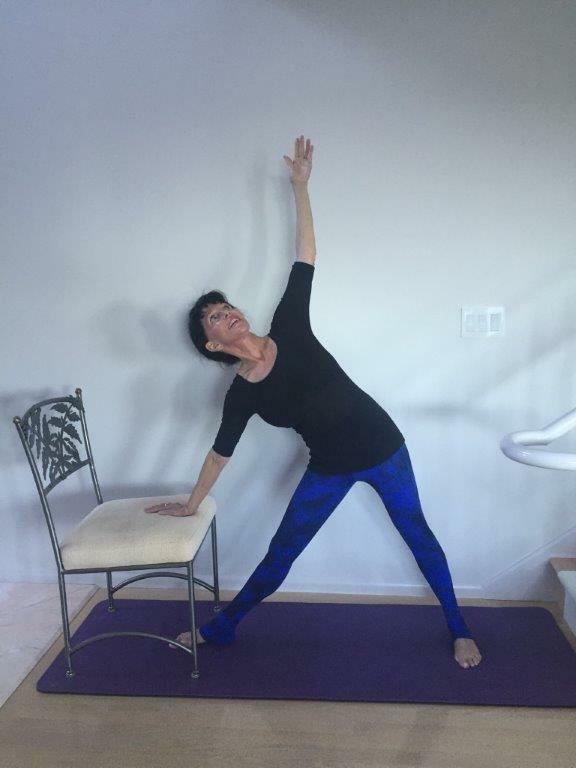 Wonderful to hear you’re taking the natural approach to strengthening your bones, Susan! Will you please send me a printable version of the yoga poses. Thank you. If you find any other posts you’d like to print, there is a printer icon on the lefthand side of the screen that will allow you to do so! I am also taking Algae Cal Plus that says take with meals. Should it be before or after?? Check your inbox – I’ve just sent you a PDF copy of the blog post! If you’d like to print any other posts simply select the printer icon on the lefthand side of the screen. Hi Monica I was so happy to see this post about the effects of yoga on the AlgeaCal site. As a 3 monthh user of AlgeaCal and Strotium boost and one who practices yoga once weekly, I plan to incorporate these 12 minutes into my routine several times a week!! How can I get the Ultimate Guide to Osteoporosis via email so I don’t have to go to each link? I can’t wait until it’s time for my next bone density scan. I just finished reading your 2013 expanded edition of Your Bones. On page 275 you state that the static poses of yoga cannot build bone. What made you change your mind? Do u still practice Pilates for Osteoporosis. The Osteogenic Loading machine people claim bone cannot be built without OL of 4.2 times body weight. Does yoga do that. They cite research that 10 minutes a week on their expensive machine is all we need to increase BD. Please comment. Thanks. Top Geriatr Rehabil. 2016 Apr;32(2):81-87. Epub 2015 Nov 5. Twelve-Minute Daily Yoga Regimen Reverses Osteoporotic Bone Loss. Lu YH1, Rosner B1, Chang G1, Fishman LM1. Assess the effectiveness of selected yoga postures in raising bone mineral density (BMD). Ten-year study of 741 Internet-recruited volunteers comparing preyoga BMD changes with postyoga BMD changes. Dual-energy x-ray absorptiometric scans. Optional radiographs of hips and spine and bone quality study (7 Tesla). Bone mineral density improved in spine, hips, and femur of the 227 moderately and fully compliant patients. Monthly gain in BMD was significant in spine (0.0029 g/cm2, P = .005) and femur (0.00022 g/cm2, P = .053), but in 1 cohort, although mean gain in hip BMD was 50%, large individual differences raised the confidence interval and the gain was not significant for total hip (0.000357 g/cm2). No yoga-related serious injuries were imaged or reported. Bone quality appeared qualitatively improved in yoga practitioners. Yoga appears to raise BMD in the spine and the femur safely. Yes, I still do Pilates as well as yoga and last year I discovered barre, which combines Pilates, yoga and ballet exercises and have become addicted to that as well. I exercise at least one hour every day. It’s my break. As my bones are now in excellent shape and have been for several years –within one year of beginning to take AlgaeCal Plus and Strontium Boost — I can do any of the exercises, not only those tailored to be safe and effective for individuals with osteopenia/osteoporosis. Arch Biochem Biophys. 2008 May 15;473(2):117-23. doi: 10.1016/j.abb.2008.02.028. Epub 2008 Mar 4. The response of bone to mechanical loading and disuse: fundamental principles and influences on osteoblast/osteocyte homeostasis. Bone’s response to increased or reduced loading/disuse is a feature of many clinical circumstances, and our daily life, as habitual activities change. However, there are several misconceptions regarding what constitutes loading or disuse and why the skeleton gains or loses bone. The main purpose of this article is to discuss the fundamentals of the need for bone to experience the effects of loading and disuse, why bone loss due to disuse occurs, and how it is the target of skeletal physiology which drives pathological bone loss in conditions that may not be seen as being primarily due to disuse. Fundamentally, if we accept that hypertrophy of bone in response to increased loading is a desirable occurrence, then disuse is not a pathological process, but simply the corollary of adaptation to increased loads. If adaptive processes occur to increase bone mass in response to increased load, then the loss of bone in disuse is the only way that adaptation can fully tune the skeleton to prevailing functional demands when loading is reduced. The mechanisms by which loading and disuse cause bone formation or resorption are the same, although the direction of any changes is different. The osteocyte and osteoblast are the key cells involved in sensing and communicating the need for changes in mass or architecture as a result of changes in experienced loading. However, as those cells are affected by numerous other influences, the responses of bone to loading or disuse are not simple, and alter under different circumstances. Understanding the principles of disuse and loading and the mechanisms underlying them therefore represents an important feature of bone physiology and the search for targets for anabolic therapies for skeletal pathology. However, no research confirming efficacy of the Osteogenic Loading Machine/protocol has been published on PubMed. http://bstrong4life.com/ the company selling the osteogenic load program began conducting an IRB trial in 2014 that is discussed on their website. No results have been published. In the “research” section on their website, they provide 2 other papers. One was written for Performance Health Systems and has not been published in any journal. The other has been published in a peer-reviewed (PubMed listed) journal. Here is the abstract for this paper, which looks encouraging, and I agree with the conclusion – a larger controlled study should be run to look into it. Aim: To determine bone density adaptation from multiple-of- bodyweight (MOB) compressive force with exercise apparatus designed for osteogenic loading. Methods: Osteogenic Loading (OL) apparatus was used to isolate optimal ranges of motion allowing for axial bone loading at levels that could be MOB (force/loading measured by load cells within the OL apparatus). Optimal positions for OL were verified by analysis of force production maximization . Volunteer subjects, mean age of 62.5(+/-8.2 SD), (n=14) performed 4 specific multi-joint movements on the OL apparatus, each lasting 5 seconds. Sessions were repeated once per week. Results: Mean peak force/loading for subjects was 9.18(+/-2.63 SD) MOB (hip/legs) and 3.13(+/-0.79 SD) MOB (spine). Since different hospitals and radiology offices were used to gather DXA data, not all subjects had both hip and spine T-scores, and weeks/sessions of using OL were not uniform, the results are presented in a case report format, depicting pre and post DXA of hip and spine. Conclusions: This MOB level of axial force has been seen to improve BMD [2, 3, 4], however has been commonly affiliated with injury. BMD improvement outcomes were observed in all subjects for one or both test sites with no instances of injury or discomfort, at levels of MOB reaching 9.18(+/-2.63 SD) MOB (hip/legs) and 3.13 (+/-0.79 SD) MOB (spine). These results suggest a larger more controlled study be done to further examine the OL stimulus and adaptation. I strongly encourage you to get an hour of weight bearing exercise every day. Whatever you find you enjoy and will do consistently will be helpful. Your website is great for the most updated info on helping us! ” The Ultimate Guide to Yoga for Osteoporosis” is something I definitely want to do… Can you send this in a direct email to me so I don’t have to go from link to link to link to get to it? Thank you! Absolutely. Sending you this blog post via email now :). Hi Monica. I am a big fan of AlgaeCal and have been using it for 3 years now. It has improved my back and hip bone density. I have recommended this to my friends too. I love your yoga poses,will try them too. Love them all. Thanks for sharing them here. Thank you for this information. I’ve practiced yoga for over 40 years and this is the first researched based article I’ve read on how yoga benefits osteoporosis and osteopenia. I’m forwarding the article to all my yogi friends. 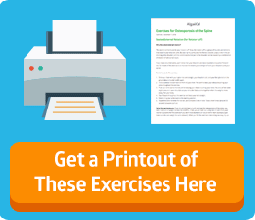 Thank you for posting these exercises, I will start working on them this weekend.